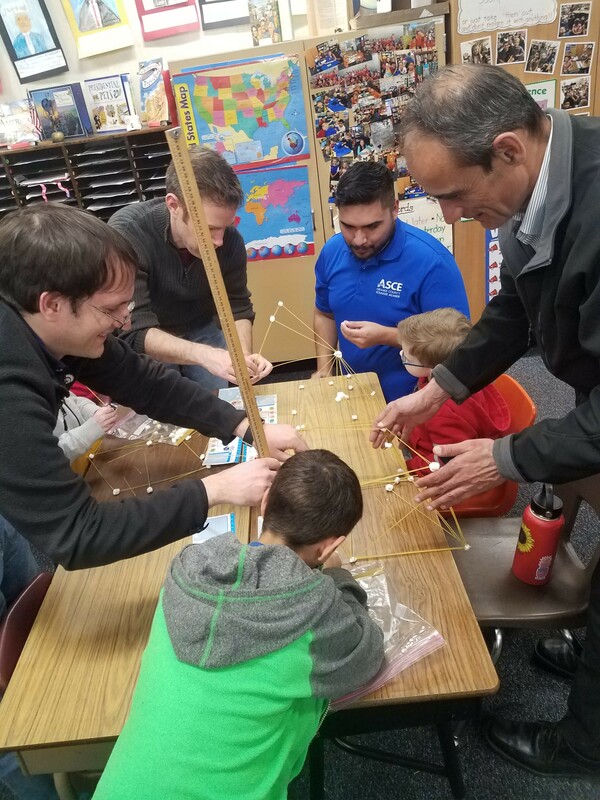 On February 8th Rancho Canada Elementary School held its annual STEAM Family Night. This is an event where classrooms open up to students and families for after-school learning and activities. Classrooms throughout the school were filled with a variety of hands-on activities such as controlling electronic robots, 3D computer modeling, star gazing, slime making, and more. ASCE OC YMF and ASCE OC Branch K-12 Outreach Committee volunteers, represented by Guillermo Medina, Victor Aguirre, Jared Lindo, Kayla Kilgo, and Jenny Mital, teamed up to provide a unique experience for the elementary students and family by holding a hands-on spaghetti and marshmallow building activity. The activity allowed individuals to work together with engineer volunteers to learn about civil engineering through trial and error. The marshmallows were used to connect the spaghetti pieces to make trusses, buildings, bridges, and all sorts of creations. Over a hundred students and family members walked through the halls participating in different activities found in each room. When participants were ready for a break they had the opportunity to purchase specialty waffle treats and refreshments from the catered eatery on site. The participants gave great feedback during the event, with rooms filled full of laughter and with children staying until the last minute of the two and a half hour event.